LONDON (AP) — Watched by the Premier League's biggest-ever crowd, Tottenham scored one of the competition's fastest goals. Manchester United hadn't even had a chance to touch the ball when Christian Eriksen put the ball in the net after 10.5 seconds at Wembley Stadium on Wednesday. "It feels a bit weird to score from your first touch," Eriksen said after Tottenham's 2-0 victory. Jose Mourinho watched aghast. "Ridiculous," was the United manager's assessment after his conceded for the first time since Dec. 26. On a night when Mourinho's side was outrun and new recruit Alexis Sanchez struggled to make an impact, United's pitiful performance was summed up by the own-goal that sealed Tottenham's win. Phil Jones inadvertently turned Kieran Trippier's cross into his own net in the 28th minute when the United defender was under no immediate pressure. "Unlucky is a different thing than ridiculous," Mourinho said. "And after that Tottenham has the game in their hands." It was a damaging defeat for Mourinho's team, with Manchester City allowed to surge 15 points clear of its second-place neighbor by beating West Bromwich Albion 3-0. United was second-best all night in front of a Premier League record 81,978 fans at English soccer's national stadium, which is Tottenham's temporary home while a new venue is being built at White Hart Lane. Tottenham set the tone with its explosive start, producing the third fastest goal since the Premier League's inception in 1992. After the kickoff, Jan Vertonghen's high, long pass from inside his own half reached Harry Kane who headed to Dele Alli and the midfielder flicked the ball across for Eriksen to finish. "We prepare that situation," Pochettino said, "... and give the signal to the opposition that we want to play in the opposition half and dominate the game and put pressure on them." "After kickoff is ridiculous, especially ridiculous because the players they watched it before, we analyze opponents," Mourinho said. "The players knew the long ball, they knew Harry Kane normally he is already inside, before the kickoff, he is already inside the opponent. We knew everything and then we don't press the ball." Mourinho broke down United's shortcomings in detail. "One mistake, we don't clean the ball in the air," he said. "Second mistake, we don't win the second ball on the ground. Third mistake, we don't cover the fullback inside when Eriksen comes. Four mistakes." It was timed at only 0.1 seconds slower than Alan Shearer's 10.4-second goal in 2003 for Newcastle against Manchester City. Tottenham does hold the record, with Ledley King netting after 9.9 seconds at Bradford in 2000. "One of the criticisms of ourselves over the last couple of weeks was our slow starts, it was something we wanted to improve on and we definitely did today," Tottenham midfielder Eric Dier said. "We were in control of the game from beginning to end, we came out and pressed them and didn't give them any time. They suffered under it." 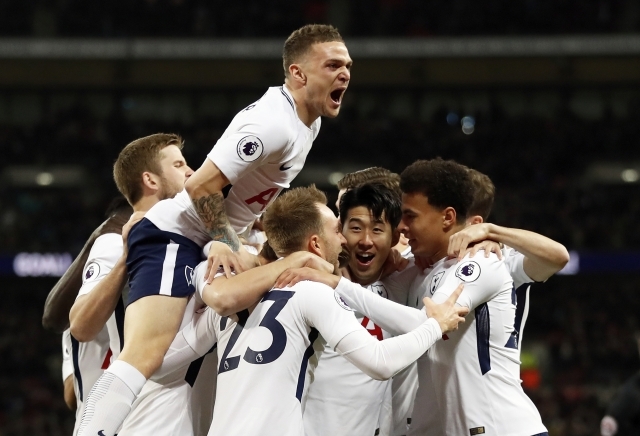 For a Tottenham side that couldn't even beat fourth-tier Newport in the FA Cup on Saturday — drawing 1-1 — beating United so convincingly reasserted its top-four credentials. Tottenham is two points outside the Champions League places in fifth, and heads to third-place Liverpool on Sunday. Liverpool felt the full force of Tottenham's formidable counterattacking potency in October when Juergen Klopp's side lost 4-1 at Wembley but inconsistency has proved costly. "You can win a game if you're ready to fight," Pochettino said, reflecting on a third successive home win over United. Tottenham goalkeeper Hugo Lloris was rarely troubled by one of the league's most-expensively assembled teams, with only one save of significance required to block a shot from Romelu Lukaku. With the title appearing unattainable, United will have to settle with locking down second place for the team's highest-place finish since Alex Ferguson won a record-extending English title in 2013 before retiring. "The distance to the leader was already considerable, even before this match," Mourinho said.